At every layer of our Trust Governance model, we have given careful consideration to roles, responsibilities and accountabilities. Each governance function plays a critical and interconnected role in ensuring the Trust operates safely and achieves its vision. Members of the Trust are the signatories to the Memorandum of Association and have agreed the Trust’s Articles of Association (the document which outlines the governance structure and how the Trust will operate). The Articles of Association describe how Members are recruited and replaced and how many Trustees the Members can appoint to the Trust Board. The Members appoint Trustees to ensure that the Trust’s Charitable Objects are carried out and so must be able to remove Trustees if they fail to fulfil this responsibility. Accordingly, the Trust Board submits an annual report on the performance of the Trust to the Members. 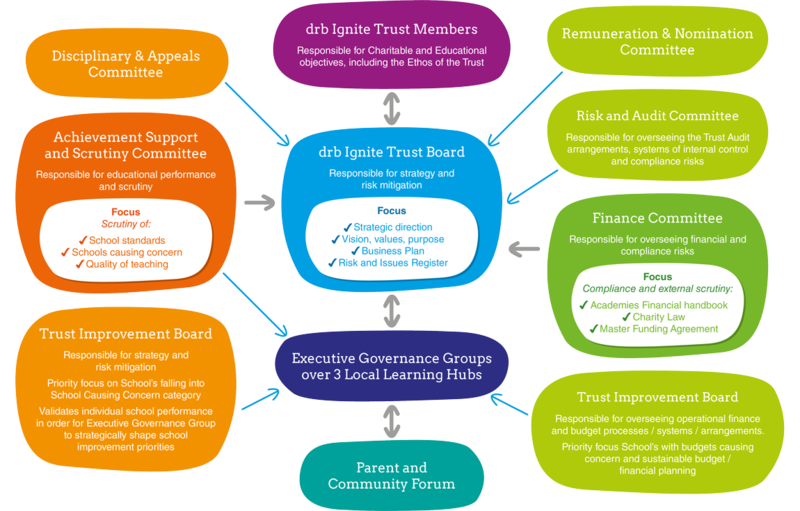 The Members have an overview of the governance arrangements of the Trust but are not involved in the day-to-day management. Members are also responsible for approving any amendments to the Trust’s Articles of Association. Members are permitted to be appointed as Trustees. However, in order to retain a degree of separation of powers between Members and the Trust Board, and in line with DfE expectations, not all Members are Trustees. Members are also not permitted to be employees of the drb Ignite Trust. The drb Ignite Trust ordinarily has five members. The Board is ambitious for all children and infused with a passion for education and a commitment to continuous school improvement that enables the best possible outcomes. It is driven by inquisitive, independent minds and thorough conversations focused on the key strategic issues which are conducted with humility, good judgement, resilience, and determination. The Board meets regularly, four to five times each year. The term of office for Trustees is four years after which they must be re-appointed. All governance work is designed to focus on achieving progress and impact within a culture of collaboration. Systems and processes are focused on supporting the effective sharing of information, helping the Board to know its schools well and ensuring efficient compliance with all statutory, mandatory, and regulatory requirements. carry our regular skills audits of the Trustees to ensure any missing expertise can be sourced to support challenge and scrutiny of specialist areas such as finance, audit, human resources, educational performance etc. Executive Governance Groups provide local challenge and support to school leadership teams in all aspects of school improvement, standards and pupil performance, fulfilling the statutory responsibilities of Local Governing Bodies. Parent and Community Forums represent the voice of each school’s local community. The forums facilitate two-way communication between parents, carers, community, stakeholders and each school. They work to provide feedback, offer constructive challenge and input into decision making and planning for future educational provision and school improvement. The Forums play a critically important influencing role to the Executive Governance Groups but have no formal statutory responsibilities or accountability.